We’re starting 2019 with one of our “Favourite Space” blog posts, where we introduce you to another one of our clever and creative friends, and show you the space they most love to hang out in. Last year we had a meeting with Hayden Borrie after several people suggested we should meet. 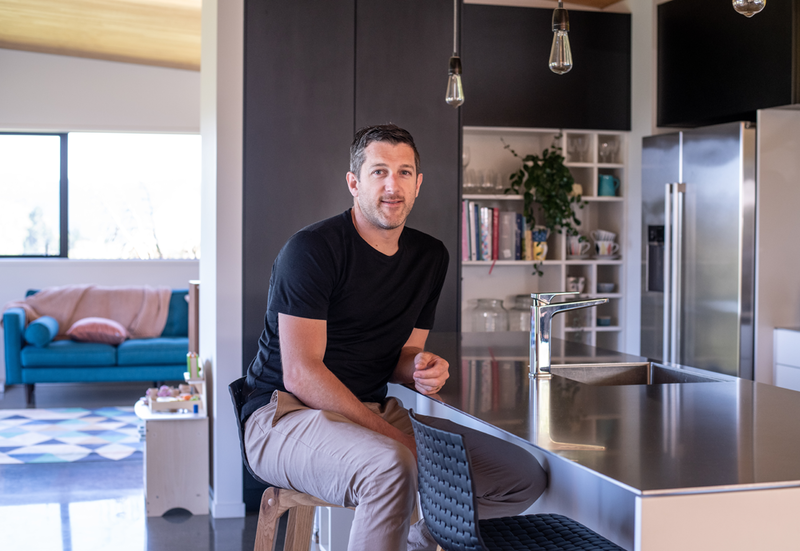 And they were so right… you see, Hayden is this super talented guy with an engineering and design background, and he was busy developing a range of beautiful products suitable for both residential and commercial environments. It wasn’t long after our first meeting that we employed his services to help us create a stunning black steel shower frame for a client of ours (we hope to have photos of this soon for our portfolio). Since then we’ve worked on other projects with Hayden and look forward to many more. For this shoot Dael and I headed out to Hayden’s home with our photographer Florence in tow to photograph his family room. Hayden shares his home in the Esk Hills with his wife, Megan and their two children Roman, 6 yrs, and Fern, 3 yrs. Hayden and Megan bought the section after returning from London, and proceeded to do a huge amount of work on it themselves. They hired architect, Andrew Young, and local construction firm, Robinson Built, but also had a lot of input into the design process. Megan managed the project and all the tradies, and the couple designed the kitchen, installing the island bench themselves, as well as tackling all of the painting and landscaping. Hayden’s range of self-designed shelving and storage is called smpl. - born out of the desire to create a shelving system for his own home. Longevity was an important factor so they are built to last with powdercoated steel frames and shelves; and wanting a sense of cohesiveness throughout his home, the range also includes bathroom accessories. Not restricted to residential, the smpl. range is great for commercial settings as well. Hayden designed and installed the shelving at our favourite local coffee establishment, Crazy Good (see below). B+B - What is your favourite space? HB - It’s what we call our 'family' room, but it’s really just all one big space including the family room, kitchen, dining and lounge. The 'openness' of the view out to the north west, while being hunkered into the hill to the east; and it feels like the heart of the house. What do you love about what you’ve created for Crazy Good? Modularity and 'the system' (you'll probably hear me say that a lot). It's going to need a bit of customer learning, but the system in CG would equally be at home in a commercial environment or residential housing. What’s your favourite time if the day? Late evening. That's when the gears start turning, and can easily go into the wee smalls :) No distractions (I love my family, really), and you can just get on with it. Simplifying unnecessarily complicated products and processes. I’m not a big fan of superfluous details, rather I prefer basic 'functional aesthetics'. I love modularity and re-use of components through a design. George Nelson would be one of my main influences. He's one of the originators of American Modernism, and I love the simplicity in his products, particularly during his time at Herman Miller. Yes, he may have taken credit for a few too many designs of others (! ), but there's no doubt he pushed design into places it hadn't been before. My Chemex pour-over 6 cup. I like the precise process of it, and that it’s the same every single time. To develop my smpl. product range further, and to continue to provide 'fresh' solutions for custom interiors (mainly from a manufacturing perspective). Oh and do more mountain biking and fishing! Thank you so much Hayden for allowing us into your home. To all our readers, make sure you go and check out Hayden’s website to learn more about his smpl. range, and follow him on Instagram and Facebook to keep up with all his new work and product design.